#01 - Chrusher vs. Foule vs. Butski - "Crusher Comics #1 | Classic ChrusherComix Season One, Issue #1 (20th Anniversary Commemorative Cover – 1988-2008)"
ChrusherComix (Chris' Crusher Comics) were founded in 1988 in a high school study hall. Innocent, goofy, immature, and slapstick violence eventually morphed into somewhat more mature offerings, and into what is now the final chapter in the story - End Cycle. Enjoy! In 1988, an Oswego High School freshman named Chris Stevens decided to take his talent of drawing and entertain himself and his friends by drawing a sketchbook-with-a-storyline featuring character-driven comedy and violence. It became a hit. This whole website is devoted to the ongoing series that started as sketches on lined paper and evolved into the sophisticated professional artwork you see today. Enjoy! In the late 1980s at an everyday high school in Oswegonia, a war is brewing between a band of nerds and misfits known as The Welforce, inept and corrupt school faculty, low-level criminal masterminds, and a band of teen quasi-vigilantes known as The Conquerors - led by a lad known as Chris Crusher - or Chrusher for short. Starting in 1988 when 14-year-old Christopher Galletta Stevens drew a comic book in high school study hall to entertain himself and his friends. The book continued ever since, and -- after never seeing print and being in storage for two decades -- has now finally seen publication! Read the exciting, humorous, and highly action-packed "sketchbook with a storyline" from the first crappily-done issues! The saga ends in the new interrelated -- but not interdependent -- "Chrusher: End Cycle" - which is also being printed simultaneously. Enjoy the unknown comic book which readers call the funniest 'unknown' comic they ever read! The fourteen-year old high school freshman who calls himself Hitman - and who others call him (S)Hitman - RaYzor Cadildo has a master plan. As a member of Welforce by default - as they moved in on his elementary school pro-wrestling grounds and adapted him into their ranks - he plots to join Chrusher's Conquerors at the expense his fellow - and soon-to-be-former - Welforce agents. Betrayal, backstabs, maniacal laughter, sadistic smackdowns and mass-defeat are soon to follow. RAISE YOUR FULL-LOADED CONDOM LAUNCHERS! FIRE! The Wrath of the Rake - Season One Jumbo-Sized Finale! Chrusher, Terminator, and Crasher may have bested Obliterator in the past. And Slasher may have hospitilized Cow and Wanna-be-Ninja Chadtraw may have killed Justin who became the Grim Raker... year year. But... see... they combined forces in the hospital. Now... the Conquerors and Welforce will have to combine forces to defeat this mad trio. Jumbo-sized finale to season one! Enjoy! The Last DaYz of the Glare - Part 1 - Crusher is Gone?! RaYzor In Command?! The Last DaYz Of The Glare: Part III - Crusher is Back... RaYzor Snaps. 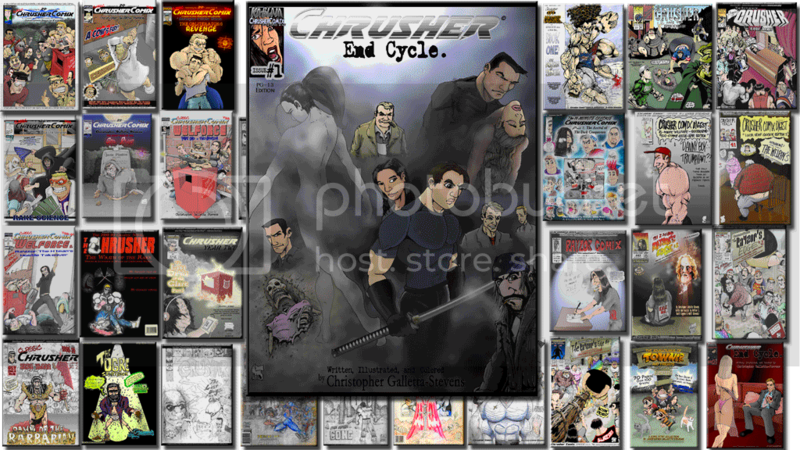 The 3rd season of Chris' Crusher Comics (portmanteau is ChrusherComix) began a far more grittier storyline with somewhat more edgy artwork (and far more detail). The greatest growth in art quality is seen between the 1st and 3rd year of my comics, all seen here on this website. Even so, typos (well, misspellings, as I hand-wrote all the text) are often seen, as well as MANY pencil smudges. My high school art teacher - a talented painter whom I greatly respected - appreciated my pencil work, but suggested to me to ink my work to preserve it, to which I did in the following season, 1992. Enjoy VOLUME 3! It is the year 1991, and a new villain has been revealed. As seen in last season's "Last DaYz of the Glare", someone has been trying to assassinate Chrusher, hiring his friend and fellow Conqueror RaYzor, mutant-like gangsters, Ninjas, his greatest foe Obliterator, and even a now perished girlfriend. The greatest challenge lies ahead for the Conquerors - Oswegonian High School Justice-Seeking Vigilante Team. And a prelude into one of the most perplexing, odd, unique, dangerous, insane, sadistic, immoral - and hilarious characters in the ChrusherComix Universe - Steven "The Renegade Barbarian Bond" Howeird!Let the madness of Howeirdmania begin! The Return of Crusher #1: "The Scourge of The Scovillian"
As Welforce gains new members in Corey & The Shark, old Conquerors are tempted by the Welf-side. Flashbacks to part-tie Conqueror Jo-Jo Bunn's backyard football game rampages begin to weave the tale of the downfall of the Conquerors as we know them. Chrusher and the gang look on in horror as RaYzor has been attacked by the loose cannon mercenary named Keith "Slasher" Clarkson - a grown-@$$ madman who wears a hooded mask like Cobra Commander and sports very sharp Wolverine-like claws (since the "Raked @$$" incident of 1988 - see "Rake Science"). Keith is coming for revenge after their once friendly rivalry started getting out of hand (see the "Slasher Comics" fan art section). What will happen to poor ol' RaYzor, who's life seems to always take on these odd twists and turns of proud triumph followed by humiliation. Meanwhile, an all new chapter is unfolding. An all-new batch of characters, complete with a roll call! From a short bus crash emerges a most peculiar lot -- The Lunaticials!!! Want more, and quicker? Help the author! None of this your thing? Like lighter, more child-friendly fare? Well, take all of the ChrusherComix characters and put them in a Peanuts and Calvin & Hobbes timewarp. And you'll have: Welcome to the little-brother comic of ChrusherComix. Imagine if some of the zanier characters from the ChrusherComix Universe were put in a time-warp, adult-humor, mature situations and violence filtered out, and properly infused with Calvin and Hobbes DNA. What happens? The Adventures of Towner & Friends is what happens. A family-friendly/all-ages-appropriate comic strip! Want a book for yourself and your kids to read? The complete collection is available via a printed anthology at IndyPlanet! Sample the book on the website here! THANK YOU! For reading and feel free to read all 1,000+ pages of my comic book and graphic novel. If you read every comic without being the least bit entertained, I will give you a prize. Jamin is one of the nicest guys one can meet. Great sense of humor, gets along with mostly anybody. Training to be a computer technician, but he isn't all brains. The kid is pretty damn muscular and ripped for a high school kid, and an amatuer wrestler. Very athletic and instantly became the muscle of the Conquerors, and Chusher's bodyguard of sorts. 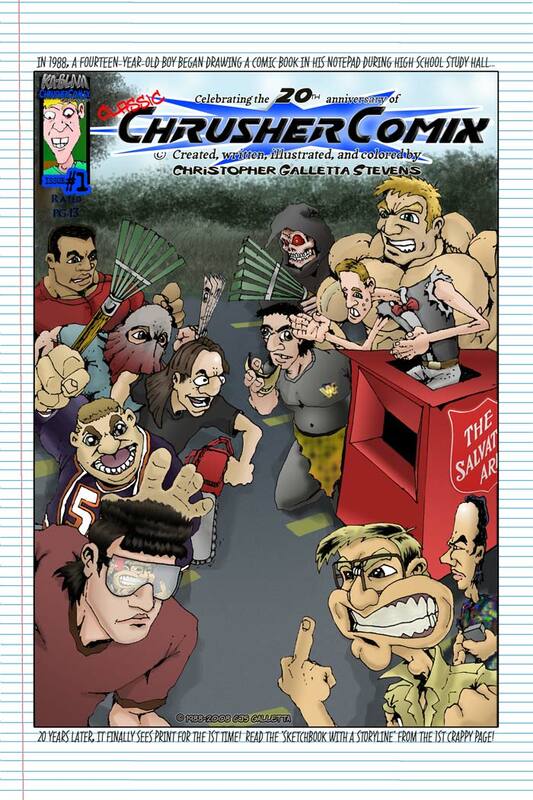 The 20th Anniversary cover to the 1st issue of Chris' Crusher Comics - AKA ChrusherComix for short! Classic Chrusher Comix #1 TM and © Christopher Galletta Stevens. All rights reserved.